The Gocycle is our number one selling E-Bike for yachtsmen and pilots for many good reasons. They range in price from $2,799 to $4,599, depending on the model. And even though we sell bikes costing as much as $9,995, the Gocycle is probably the most technically innovative one we carry. The Gocycle is our lightest E-Bike at 34 pounds. It’s a folding, 20-inch bike with both front and rear suspension, which is unusual for a road E-Bike. Gocycles are hand-made in England and are currently the only E-Bikes we know of that are made from magnesium. They have a powerful motor and reach their top speed of 20 mph quickly. They also climb Seattle’s steepest hills with ease. For any other E-Bike, each of these attributes would involve a compromise. The benefits are tremendous: light weight, portability, and the ability to fold into a purpose-made canvas bag with an internal docking station. The bag makes the Gocycle incredibly easy to carry and store. It’s extremely rugged and waterproof, and takes up up only 8.5 cubic feet of space. Half the trunk size of a Honda Accord. 20 inches is a small wheel size that would normally adversely affect ride and efficiency. But Gocycle employs a frame with a wheelbase the same length as a 26 inch bike which solves the ride problem. It also utilizes unique, high pressure 20-inch tires and tubes to duplicate a full size bike’s rolling efficiency. 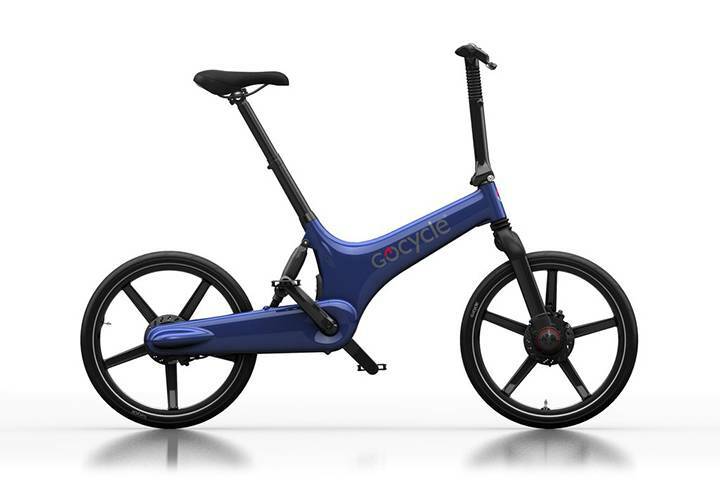 The mechanism employed for all folding bikes other than Gocycle significantly increases weight, and worse, reduces rigidity, which saps the power of the motor and the rider. More than any other factor, rigidity is what makes a bicycle efficient and a pleasure to ride. 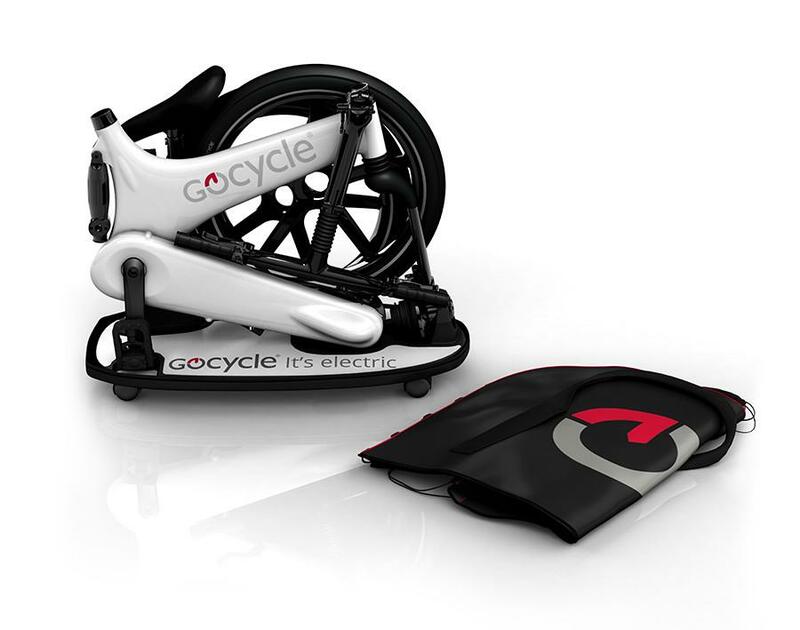 Gocycle employs a unique, proprietary locking system that eliminates the loss of rigidity and reduces the weight. All other full suspension bikes trade off increased shock absorption for rigidity, which is, as discussed, critical to efficiency. But not Gocycle, which employs a shock design that does not affect rigidity. How is all of this possible? Superb design and materials. Gocycle is owned by Richard Thorpe who was a design engineer for the McLaren Automotive Group. The McLaren Formula One racer weighs 1,670 pounds (less than half of that Honda Accord with the trunk) and reaches 202 mph. It needs to be extraordinarily rigid, and it is. Formula One racing is how Ferrari, McLaren, and Mercedes develop the expertise to build superb automobiles. It’s that same racing heritage that is built into the Gocycle. That expertise is enjoyed by yacht and plane owners around the world, which is why they specify Gocycle. Even if you don’t have a plane or a yacht, and even if you do not need your E-Bike to fit in a canvas bag, you will still love the Gocycle. Come in for a test ride or see us at the Seattle Boats Afloat show on Lake Union.